In a small Central American country with a population of 270,000, three veteran musicians share moments of their daily lives with us. Paul Nabor, 79 year old fisherman and legendary Garifuna composer has played the same guitar for 53 years. Even though he has forgotten most of his songs, his spirit remains strong. Florencio Mess, a Maya harp player, spends his solitude making traditional violins, guitars and harps as he awaits for his next trip outside his small village. Creole accordionist, Wilfred Peters, is proud to have played for the Queen of England, his ineffable charm and humor is his ideal antidote for the old age. Each, in their own way, remind us that nothing is eternal, as time goes by and progress settles in. Despite the lack of interest by the younger generation, these three extraordinary men offer us a glimpse of hope, freedom and humanity. Born in Valladolid (Spain) in 1973, Katia now lives and works in Montreal. Bachelor in Communications from l’Université du Québec à Montréal, she has been working in the field of audiovisual production since 1996. In 2002, she explores the new possibilities offered by smaller digital cameras. 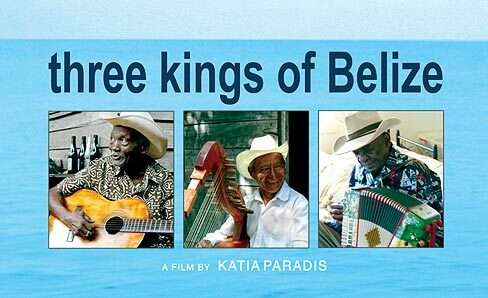 Three Kings of Belize is her directorial debut.